I want to take a look at how Berry Tramel, the well-known and longtime local sportswriter for The Oklahoman, responded to the recent Sports Illustrated articles outlining problems in the Oklahoma State University football program. Tramel’s responses are the most thorough, at least in writing, to the articles among local reporters, and Tramel’s undoubtedly the newspaper’s best writer, but his defensive reaction to the articles was representative among the media types here and shows why it takes an out-of-state publication to reveal information that should be of interest to Oklahoma taxpayers. (Note I wrote, should.) His responses were also filled with cringing sweeping generalizations whenever he ventured into matters such as academics and drug use among players. None of Tramel’s responses really get at this issue: There are present and former coaches here in Oklahoma and elsewhere who have become multi-millionaires at taxpayer-supported institutions only through the athletic talent of young men, most of whom don’t go on and play professional sports and some of whom get terribly exploited. These coaches deserve scrutiny and should be held accountable for their actions, and that includes Mike Gundy and, yes, Bob Stoops. I think it’s fair to say one of Tramel’s overall points, and he responded to each article, is that the series of articles by SI were over-hyped and often didn’t live up to their promotion. The problem with this argument is that big-time college and professional sports are highly dependent on media hype. Tramel’s income from The Oklahoman is dependent on hype. (In fact, he’s hyping the “hype” to make a living in this case.) Take away the hype and the spectacle from big-time sports, the good and the bad, and what do you have? Well, you don’t have as many fans, that’s for sure, and you don’t have as many readers, viewers and listeners. Note the tone here in Tramel’s quote. He essentially qualifies paying players, but then supposedly claims paying a recruit is a serious issue. No, it “doesn’t completely jive” either. As I wrote earlier, I think players get exploited as coaches run off with the money, and the system should change, but paying players for making individual plays is a complete violation of any college’s mission. Does an OSU band member get paid $500 when they play their instrument particularly well at a game? Does a member of whatever the OSU Spanish Club is called get $1,000 for speaking in perfect Spanish at a meeting? Does a . . . Why go on? The point is big-time college football programs are not professional teams. If they can’t be part of the university because of the corruption of money, then privatize them by spinning them off into farm teams for the NFL. 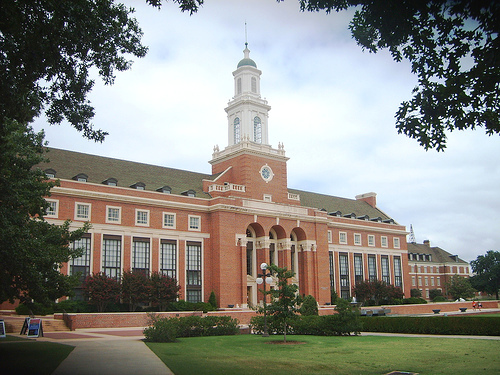 SI‘s academic arguments, some of which are widely known or suspected on campus (for the record, I taught at OSU in the late 1980s and early 1990s), are extremely important. The allegations alleging direct cheating may not be important to Tramel, but they are to most professors I know, and I’ve been teaching college going on 25 years in this state. Cheating is an issue on all university campuses, of course, but if and when a head football coach, a powerful, multi-millionaire enriched by the university, enables or ignores the cheating, it’s even worse. Also, Tramel’s comment about online courses is a sweeping generalization, which shows he probably doesn’t know much about them. Online courses are here to stay. Online education is the happening thing in higher education today, and quality-controls and academic integrity are a major part of online initiatives. Tramel doesn’t know what he’s talking about, and it shows. Tramel begins his assessment of SI‘s story about drug use among OSU’s players with the tone he maintains throughout his analysis. He writes, “And just like the others [articles], it’s a difficult sell for SI, for this reason. The sources are all a bunch of potheads, by their own admission.” He then argues that OSU made mistakes by recruiting “knuckleheads,” and that’s the main problem. The issue, as I see it, is not so much that there’s a drug culture surrounding the OSU football team-we all live in a drug culture-but how the university responds to someone who really has a problem. The disparity in the responses, as outlined in the SI article, is the problem. Tramel, with his use of “knuckleheads” and then this, ” . . . we’re not talking about the brightest of the bright when we talk about people who want to toke their way to happiness,” shows he might just be a tad out of touch. I know they don’t “smoke marijuana in Muskogee,” Berry, (of course, they do a lot of meth there these days) but they can still be durn knuckleheads, too. My point is Tramel is over his head on this issue. Here’s an idea: Just don’t drug test players at all except for performance-enhancing drugs unless there’s an issue, such as an arrest or obvious abuse. does-it excuse, but that, too, misses it. This is a school activity at a taxpayer-supported institution. The university should broaden the membership of the program if it plans to keep it, and millionaire coaches shouldn’t be allowed to dictate its membership based on a person’s appearance. Tramel claims that part of the final installment of the series, which showed the sometimes broken lives of former non-star OSU players, was “a little overdramatic. Seems like someone tried to write their way to making this series a success.” He even argues that another part of the article is “total crock.” Again, note the defensiveness and the sarcasm. OSU does have a responsibility to those young students who get cut from the football program for one reason or another. Most of them were recruited and given scholarships, and some moved from their out-of-state communities to Stillwater. Obviously, determining what that responsibility is can be problematic, but one thing is certain: Cut players should be given every opportunity to continue their education. Again, the immoral disparity between millionaire football coaches and a poor kid who gets cut from a program should be the issue here. It just violates the academic and the overall mission of the university. It’s not right. OSU is a public college, not a farm team for the NFL. I don’t think I’ve been too harsh on Tramel, and, at least, he took the time for thorough responses. One important issue, which I’ve already brought up in early post, is that local media outlets here are complicit in the “corruption,” or whatever you want to call it, of the state’s two major college football programs. These programs not only make a lot of money but also help create a local media industry, from the sports pages to radio shows to television programs. If you ask me, to use a Tramel-like sweeping generalization, that’s the real scandal. Taxpayers essentially are helping fund millionaire coaches and our local sports media “celebrities” while many young players get discarded, don’t make it to the NFL, or don’t finish their degrees. It’s an ugly system that needs to change, but it won’t as long as the money flows in. I think the SI articles shed some light on one of our state’s major college football programs, and that’s a good thing.